You’ve seen all those night car races and probably wondered how the organizers manage to light up the track so well that it almost appears as if it was daytime. You pondered and found out that they use strong LED (light emitting diode) lights to illuminate the track. And then you thought about how it would be a clever idea to have a home version or better yet an LED light for your truck or SUV. How many times have you been out off-road, camping, hunting, or maybe just driving to and from home on uneven, not lit up terrain during the night? How many times have you had your normal light just stop working? You’ve decided you need an LED light for your home, car, truck, boat and you need to know which one you should get. Thankfully, we have tried three of the best ones and here is our verdict. 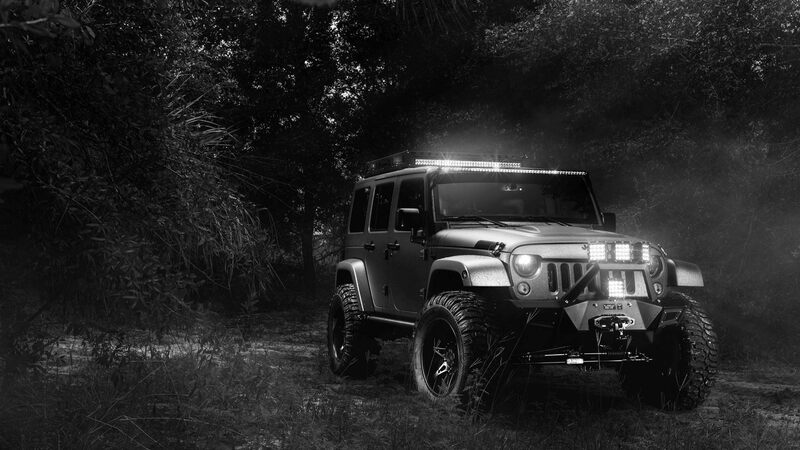 This Auxbeam light bar is 22’’ long and weighs only 6 pounds. Because of the low weight, you can put it on the top of your car cabin, the hood or even inside the grill if you want it for your truck or jeep. If you need it for a boat, you can put it on a rail, or even at the bow. The bar has 80 high intensity Philips chips in a combination beam pattern. It has 60 spot lights and 20 flood lights. A spot beam covers 8-10° in a cone of light while the flood beam covers a 90° angle of light spread. Combined, they make for a perfect illumination tool. 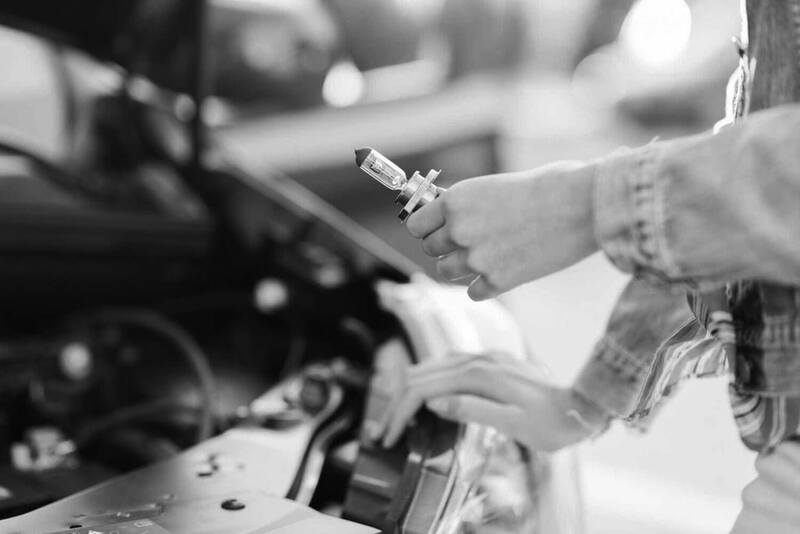 To power the bar, you either need a battery or a 12V source in your car. The LED bars will last through 50000 hours of use. Their operating temperature is between 45-85°C. The Auxbeam is IP67 certified so it’s dust proof and will work for 30 minutes 3 feet deep in the water. The pure white light is efficient, and there are no dark zones. It provides an illumination of 8000LM (lumen) which is equivalent to a light bulb of 300W. 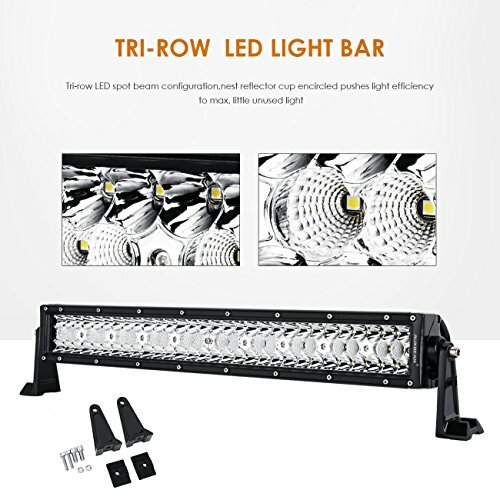 The LED bar is suitable for use on emergency vehicles, construction vehicles, normal vehicles, off-road trucks, and jeeps or indeed on agriculture machines such as tractors or combines. You can also fit them on quad bikes, trains and boats. This curved LED light bar is 42’’ long and only slightly heavier than the previous bar at 8 pounds. 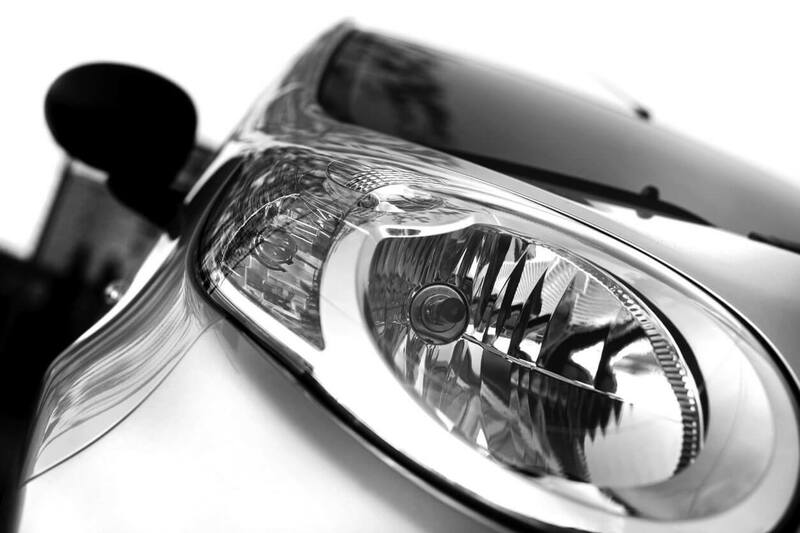 Because it is so long and curved, its light covers a wider area and reduces road hazard in a blind spot. Customers have described the light it produces as amazing! 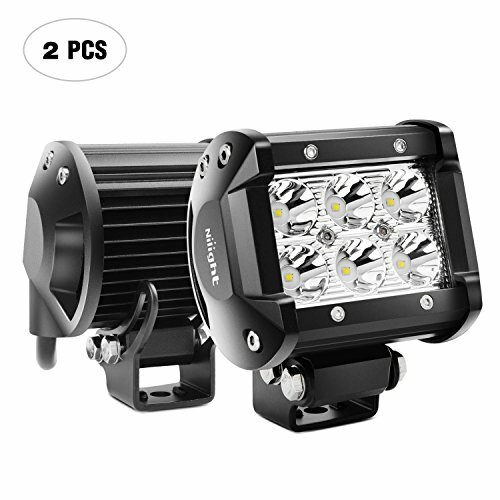 It’s equipped with 80 3W-high-intensity LED lights with a lifespan of about 30,000 hours. It’s made from durable materials and features a very strong housing and heavy duty mounting brackets which won’t fail even in the worst conditions. The housing is made from an aluminum alloy and it’s IP67 certified which means it also is dustproof and waterproof like the previous bar. The lights are fitted in combination beam pattern, with spot lights and flood lights to provide around 8000 LM of illumination. This Nilight bar is twice as long as the previous bar, so it can go on even larger vehicles but once again it can be mounted on several types of vehicles, including emergency vehicles, military vehicles excavation and other digging machines, construction machines, boats, and trains. You can also use it for your house, garden, garage, maybe even a working area that requires strong illumination. It’s also suitable for use as a security light. If you want to use it indoor, make sure you use a voltage transformer. The brackets are adjustable up to 360° along its horizontal axis which is a good option to have. This is a set of smaller LED bars which only have 6 lights each. Still, a single bar produces a massive 1260LM of light over a life span of 30,000 hours. The pair of bars come at a great price as well. Unlike the other two, which are combo bars, these have a spot beam pattern and produce a concentrated beam carried along a longer distance. 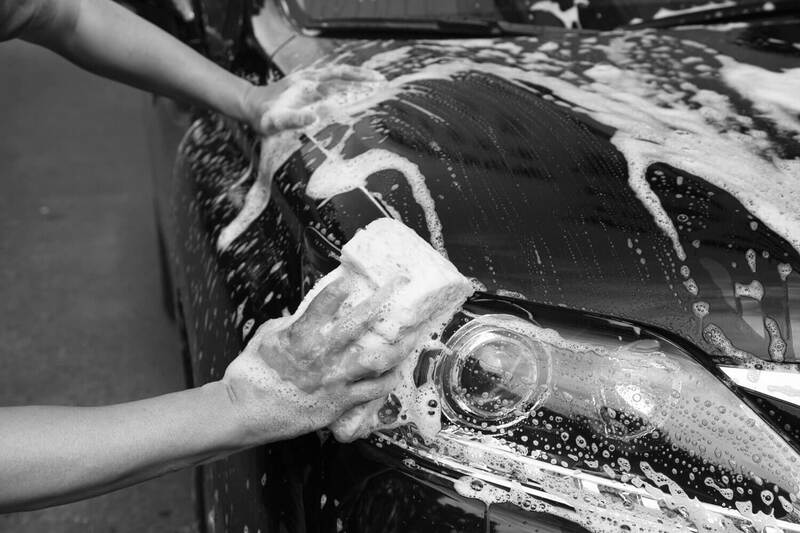 It’s also IP67 certified, can last up to 30 min in 3.3 feet of water and prevents the dust from coming in. Its casing is aluminum alloy, and has cooling fins to prevent it from getting too hot. The brackets that come with it are special as you can install them at a 45° angle. This gives you the freedom to move the light left and right so you can effectively cover more ground (up to 90°) if you put them on the side of the vehicle, in front of the side mirrors or up on the roof. 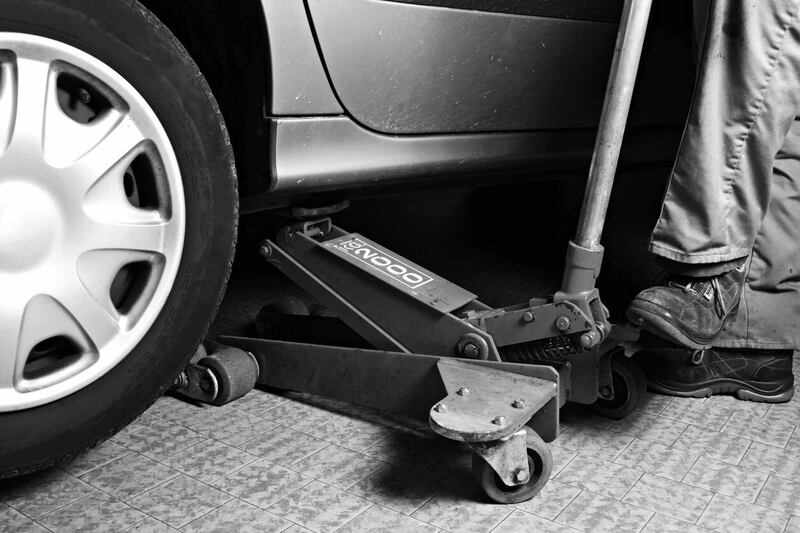 As they come at a great price, you can get more of them and fit them where you need them. They are perfect for smaller vehicles like ATVs (all-terrain vehicles), quad bikes, snow bikes, normal bikes, forklifts, small diggers and so on. If you are adventurous, you can mount them on top of your bike helmet as long as you can provide an adequate power source. Throughout this review, we have compared the illumination of the lights, the life span, functionality, area of the spread, and, of course, value for money. They are all great illuminators for various purposes, well designed and built, capable of withstanding harsh terrain and conditions. All are IP67 certified against dust and water. 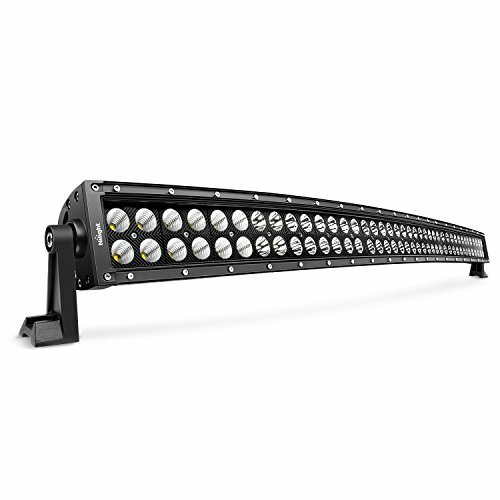 If you have a large vehicle you should choose one of the two long LED bars, the 22’’ or the 42’’ one. If you need an intense light for a smaller vehicle, like an ATV for instance, you should choose the smaller Nilight LED bars.